On the outskirts of Lagrasse ( 20 mins from Carcassonne) through the Alsou gorge Villemagne is a winegrowing hamlet which offers beautiful unobstructed views of the surrounding vineyards and rolling hills of the Corbieres. Set over 3 floors the house is ideal for 2 families sharing. On the ground floor the 90sq. metre open plan living area features 4 large sofas, dining table overlooking the garden, satellite tv, wi fi and access to the patio with dining furniture and barbecue. The spacious kitchen is also on this floor which overlooks the garden and pool. There is a shower room in this area. A utility room with French Windows leads to the terrace. The marble staircase leads to the first floor with 2 double bedrooms (one king-sized) and a shower room. The bedrooms are all well furnished, mostly with antique pine. The second floor has 1 king-sized bedroom and 1 bedroom with 2 singles (Victorian pine beds). There is also a bathroom on this floor. The garden is accessed through secure gates with ample off road parking. It is planted with various trees including cherry, plum, apricot and olive. You can relax around the pool ( with sunbeds) and listen to a variety of birds which inhabit the area. There are Roman steps into the shallow end of the 9.5 x 4.5 metre pool which gives easy access for young children. It is possible to have a wonderfully peaceful holiday in the south of France even at the height of the holiday season in August! 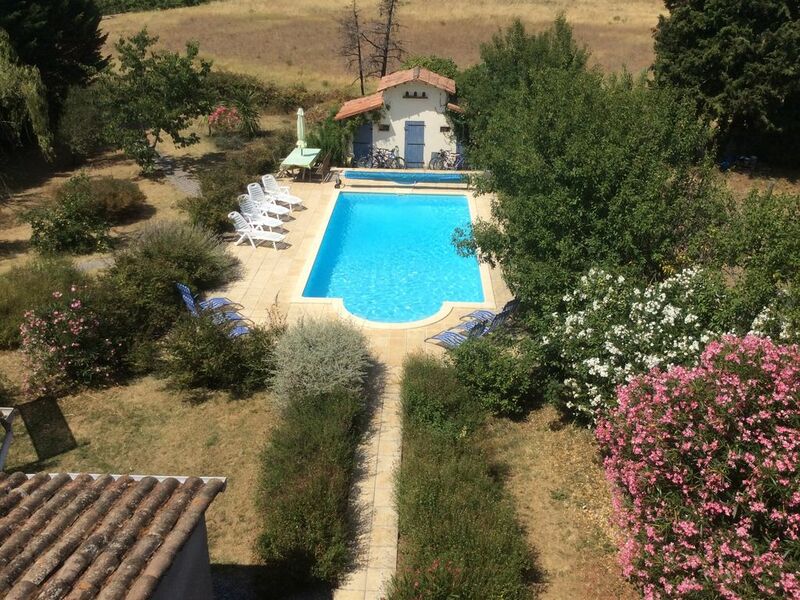 Elaine’s house is set in remote but beautiful countryside opposite the Villemagne cave amid rows of vines and rolling hills. It has the advantage of a secluded private pool set in a rambling garden with fruit trees and shrubs with views of the surrounding countryside. It’s not overlooked at all and the only sounds you hear are birds and tractors. The house itself is simple but comfortable. All the bedrooms are large so there’s no arguments about who gets the best room while no ensuites means all the bathrooms can be used by everyone. The house is very homely. It’s easy and just works. The only downside was a brief flood in the kitchen due to a heavy downpour and some dodgy drainage but it all passed quickly. All in all, a peaceful and relaxing holiday enjoyed enormously by everyone, even our grumpy teenagers. Thank you Emma. So pleased you had a good time in Villemagne and the storm didn’t impact on your stay! Beautiful home in very quiet, rural surroundings which comfortably housed our party of 9 (4 adults 5 teens). The pool and surrounding gardens were very relaxing and there was a constant cooling breeze. The hamlet was very small with no real facilities apart from the fantastic vineyard which offered great wine tasting and informative tours (great walk into surrounding hills) as well as gifts of fresh tomatoes! However there was plenty around at Lagrasse, Servies en Val and Trebes. Finally, Elaine was delightful! Thank you, so glad you had a good time. It was great to meet you and hopefully you will return to the area at some point soon. We had a fantastic holiday, while staying in Elaine’s house in Villemagne. The house is very spacious and the children were virtually swimming every day. We loved staying in Villemagne, a very small village with only about 6 or 7 seven house. Being opposite Chateau Villemagne definitely also contributed to our holiday. Be sure to taste some of their “Blood from Stone” white wine; it is unique and very special. It does not take long to fall in love with the house, the village and it’s surrounding. I can highly recommend Elaine’s house in Villemagne. So glad you enjoyed your holiday . This is a gorgeous house, beautifully furnished, with everything provided for you that you could possibly want. Elaine the owner could not have been more helpful and the surrounding villages provide plenty of shops, restaurants etc. Magnificent beaches are 40 minutes away and Carcassonne city is great for shopping and eating as well as sight seeing. We had an amazing holiday - I cant recommend this house enough. Thank you Rachel...so glad you enjoyed your stay....it was good to meet you all. I hope you will holiday in the area again at some point. séjour agréable, maison bien décorée, attention à la sécurité avec des enfants !!! La piscine est accessible de partout sans aucune sécurité pour les enfants ! La réglementation française oblige des mises en sécurité des piscines privées ! Il est étonnant que le site de location accepte ce genre d'infraction car il est responsable . Il faudrait aussi remplace le barreau manquant dans l'escalier . Villemagne is located 8kms from Lagrasse in the direction of Carcassonne.20 minutes to the Medieval Cite and 25 minutes to the airport. The bustling small town of Trebes on the Canal du Midi is less than 15 minutes away and has a couple of good fish restaurants on the canal side. The nearest village of Servies en Val is just 3 kms and has a good baker (which delivers to Villemagne each morning),butcher, shop, post office and cash point machine. It also has a bar which also serves good food! Lagrasse at 8 minutes is classed as one of the most beautiful villages in France. The 12th Century Abbey sits on the river running through this Medieval Village. It has a tennis court, shops, restaurants and a good Saturday morning market. There are also opportunities to buy from local artists and potters in the craft shops in the village. There are multiple opportunities for wine tasting in the region including Chateau Villemagne opposite the house. The hamlet is surrounded by the hills of the Corbieres and offers great opportunities for walking and bird spotting. The area is inhabited by Buzzards, Hen harriers, Eagles and Herons . The house is in a perfect location for use as a base to discover all of the Cathar Castles, beaches, regional food and wines and multiple tourist attractions the area has to offer. A bread van delivers daily with a selection of breads and pastries. The pool is open from 1st May-31st October. I will try to be flexible with dates but must be Friday or Saturday in peak season.